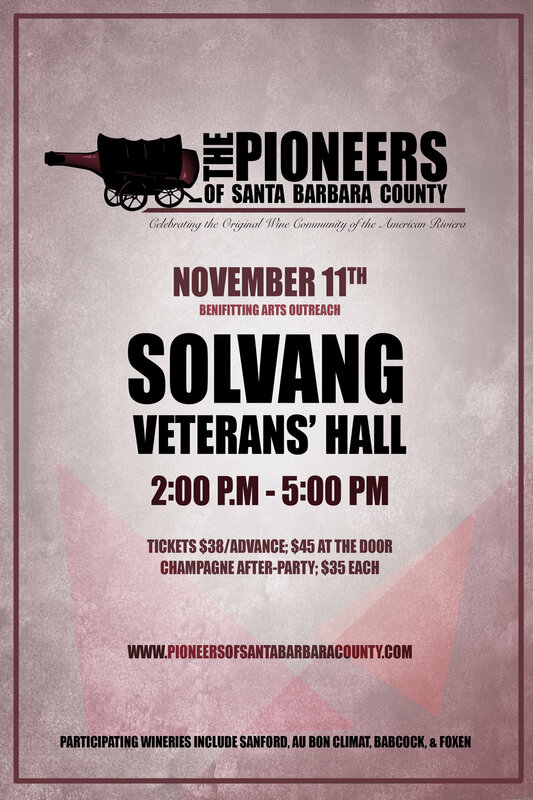 More than 20 of Santa Barbara County's trailblazing vintners will be the focus of an afternoon wine tasting event at the Solvang Veterans' Memorial Hall on Saturday, Nov. 11. 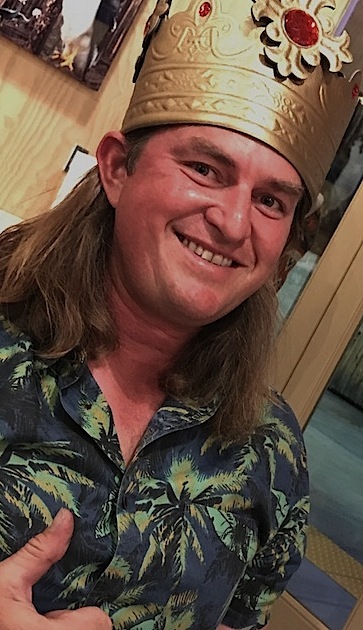 Morgan Clendenen, winemaker/owner of Cold Heaven Cellars in Buellton, has organized the event, and said that proceeds from this first event will benefit Arts Outreach of the Santa Ynez Valley. “After expenses, most of the proceeds will go to Arts Outreach, but we will keep a bit of seed money for the spring tasting,” Clendenen said. The 2017 vintage is the 47th for a handful of pioneering winemakers who focused on turning Santa Barbara County into a world-class wine destination. The younger producers who have followed in the pioneers’ footsteps have those early visionaries to thank for being such good stewards of the land. The debut tasting features a general tasting from 2 to 5 p.m., with a VIP champagne after-party and reception with the winemakers from 5 to 6:30 p.m.
“It is an extraordinary venue for those who want a hands-on experience with the titans of our industry,” Clendenen said. Winemakers scheduled to participate as of Nov. 3 include those from Andrew Murray Vineyards, Au Bon Climat, Babcock, Beckmen, Brander, Cold Heaven Cellars, D’Alfonso-Curran, Fiddlehead Cellars, Firestone, Foxen, Hitching Post, Ken Brown, Kita Wines, Lucas & Lewellen, Lumen, Margerum Wine Co., Qupe, Sanford, Shokrian, Verdad, Whitcraft and Zaca Mesa. Tickets for the tasting are $38 in advance and $45 at the door, and $35 for the reception. Visit www.pioneersofsantabarbaracounty.com for tickets and more information. Early-bird ticket sales of $73 for both tastings are available through Nov. 9. For more information, email Clendenen at morgan.pioneersofsbc@gmail.com. From the Mission era of early California through the Ranchero and Pueblo eras, winemakers in Santa Barbara County have combined traditional techniques with the latest cutting-edge viticultural and cellar practice to craft their wines. While it started with just a handful of producers, Santa Barbara County now comprises more than 200 wineries, six American Viticultural Areas (AVAs) and vineyards that grow more than 50 grape varieties. The nonprofit Arts Outreach started in 1980 with five volunteer artists as an arts-in-school program. Today, it has grown to a collaboration of more than 70 professional artists who promote the visual, literary and musical arts in the Santa Ynez and Los Alamos valleys. The organization serves more than 3,000 students and residents of Santa Barbara County. Program activities include elementary school classroom workshops and ongoing art curriculum led by artists in residence, summertime arts and drama programs; after school art; semi-monthly Elder Arts entertainment; and the annual Applause Young Artists program. The Solvang Veterans Memorial Hall is located at 1745 Mission Drive (Highway 246). Winemaker Mikael Sigouin and John Belfy, owner of Buona Terra Farming vineyard management company. More than one month ago, when winemakers were still in the thick of harvest, Kaena producers Mikael and Sally Sigouin took a night to celebrate grenache and food. After all, Sept. 15 was International Grenache Day, and Mikael Sigouin IS the King of Grenache. The couple and Janet and Jeff Olsson of Industrial Eats hosted a Kaena winemaker dinner to demonstrate just how well wine can and do pair with spicy vegetables and meats. When a pairing of spicy food and wine is left to amateurs, yes, it’s true — fire-spice laden foods can “flatten” even the most robust of wines. But on this night, we were in the care of professionals: Two couples that are innately familiar with the others’ offerings, and made the flavors of the food “sing” with the selected wines. Jeff Olsson started us off with an oyster, uni and avocado plate paired with the 2016 Kaena Grenache Blanc. As Jeff Olsson and his staff plated our various courses and began serving, the Sigouins poured both current and library releases for each dish. Kaena General Manager Chloe Redmond told me that a few seats were added at the last minutes, and the evening was a complete sellout. Seated near the Sigouins were John Belfy and his wife, Debbie. Belfy owns Buona Terra Farming, the company that manages many of the vineyards from which Mikael Sigouin sources fruit, among them Tierra Alta. Sigouin lauded Belfy, noting how the latter’s passion for farming grapevines results in consistently good fruit for his clients. He really is the King of Grenache. Sigouin founded Kaena Wines in 2001 to focus on his passion: Grenache. His colleague and fans nicknamed the winemaker “The Grenache King,” and while Sigouin also produces syrah, sauvingnon blanc, viognier, riesling and grenache blanc and a couple of blends, his focus has and will continue to be grenache. Our six-course meal featured the first two paired with grenache blanc and rosé, respectively, and the remaining four with various grenaches. The evening’s second course paired Olsson’s dish of tomatoes, melon, green chile and grilled ciabatta with Mikael Sigouin’s 2016 Grenache Rosé, and it was spectacular. The rosé stood up to the spice of the tomatoes and the flavors melded perfectly. The ripe-fruit essence of grenache — be it fresh strawberry, raspberry or watermelon — is the flavor that will stand head to head with the heat of spicy foods. Sparks at Liquid Farm's Lompoc winery slash tasting room, where he also pours Kings Carey by appointment. Winemaker James Sparks, one of 10 children raised in a Mormon household in Idaho, radiates kindness and humor, making him very easy to like. His Kings Carey wines — two grenaches and a rosé — display a similar grace and spirit and are luminescent on the palate. I first met Sparks in Los Olivos when we worked next door to one another in Los Olivos — he at Dragonette Cellars’ tasting room, and I at Tercero Wines. After a fashion, Sparks shifted from sales to the cellar, and it was during harvest 2013 that he became winemaker for Jeff and Nikki Nelson’s Liquid Farm, which at the time shared space with Dragonette in Buellton. Since Liquid Farm is predominately chardonnay (only recently did it release two pinot noirs), Sparks knew the focus of his own label would need to be different, and he chose grenache. “My focus is a single varietal, small production and wine that is expressive of a particular vineyard,” he said. Grenache has rocketed to prominence from the “G” in GSM blends to a standout red reknowned for its essence of fresh strawberry and watermelon on the palate and food-friendly structure. The Kings Carey 2016 grenache rosé was sourced from Brick Barn vineyard in the Santa Ynez Valley. It is an all-season pink, perfect for pairing or sipping alone. He and his wife, wine and food publicist Anna Ferguson-Sparks, christened Kings Carey in honor of their hometowns: Carey, Idaho, for Sparks, and Kings Point, New York, for Sparks-Ferguson. The first Kings Carey’s vintage was that of 2014, but the couple held off releasing both it and the 2015 until last spring so that Sparks could focus on Liquid Farm production and the relocation of that label from Buellton to Lompoc. Both vintages spent about 16 months in barrel, Sparks said, and while the 2015 is very light, the 2014 is bigger, a “more typical” grenache. The grapes for both vintages hail from John Sebastiano Vineyard in the Sta. Rita Hills. The grenaches retail for $29 each, and the rosé for $20, Sparks said. “I wanted to make wine that I could afford to drink myself,” he quipped. Kings Carey’s case production is small and will remain so, since it’s only Sparks at the helm and Liquid Farm is still his day job. The total number of cases of his 2016 Kings Carey Rosé was well under 100, he said. Therein lies the fine line small producers walk; a first vintage must be small enough to sell out yet large enough to fund the business and grow the name. In order to make their label stand out, he and Sparks-Ferguson enlisted Hawk Krall, a Philadelphia-based illustrator and artist well respected for his food illustration. The artist’s work has been showcased in street murals, in clients’ homes and businesses, on posters and menus, and on packaging, according to the Kings Carey website. During the harvest just past, Sparks broadened his scope to include Semillon grapes, which he brought in from Happy Canyon’s Vogelzang Vineyard. That wine will be released in 2018. Sparks and Sparks-Ferguson reside in Solvang with their daughter, Bea, 2. On Wednesday, March 8, more than a dozen of Santa Barbara County’s women winemakers will gather around tables in solidarity and camaraderie to celebrate International Women’s Day with wine, cuisine and good company. The evening runs from 5:30 to 9 p.m. at K’Syrah Catering & Events’ new venue, 478 4th Place in downtown Solvang. Only 75 tickets will be sold, which guarantees attendees and intimate evening with winemakers and chefs. The evening will benefit the Women’s Fund of Northern Santa Barbara County. The dozen-plus female winemakers will be joined by some of the Santa Ynez Valley’s most inventive female chefs, who are creating a five-to-seven course meal to pair with their colleagues’ wines. Among the wineries participating as of today are Buttonwood, Cambria, Casa Dumetz, Cebada, Dreamcote, Fiddlehead, Harrison-Clark, Kitá, La Montagne, Lepiane, Lumen, Nagy, Rideau, Rusack, Sanford, Story of Soil and William James Cellars. Additional wineries are expected to join up in coming weeks. Creating the menu will be Chef Pink of Bacon & Brine, Chef Brooke of the Union Hotel, Cheese monger Janelle McAtamney and Baker Amy Dixon of The Baker’s Table. While the national percentage of female winemakers is about 10 percent, Santa Barbara has a much higher rate of women winemakers — nearly double the national average. Despite its reputation as a glamorous and romantic industry, winemaking is hard, dirty work. A typical day during harvest requires rising before the sun, hauling wine hoses and wrangling barrels in the cellar, all the while utilizing sensory skills to craft balanced and elegant wines. At day’s end, winemakers swap boots and jeans for business attire and hit the road to sell their wares across the nation Many women winemakers accomplish all of this while raising families and staying active within their communities. “International Women’s Day has traditionally focused on labor and work conditions,” said participating winemaker Karen Steinwachs, general manager/winemaker at Buttonwood Farm Winery & Vineyard, and the owner/winemaker of Seagrape Wine Company. She anticipates that the March 8 dinner will be “a kinder and gentler protest” against the current administration. The theme for the 2017 International Women’s Day is “Be Bold for Change,” according to the website. The beneficiary, the Women’s Fund of Northern Santa Barbara County, a giving circle whereby individuals combine money and/or time so that they can have a bigger impact on the causes most important to them – more so than they would by donating individually. Since its inception in 2007, the organization has given an average $104,000 back to the community every year, according to its website. International Women’s Day has been celebrated since 1911. Alison Thomson with her wines at JCR Winery in the Lompoc Wine Ghetto. Following in the footsteps of her great grandfather, an Italian immigrant, Alison Breazeale Thomson produces small lot wines using locally grown Italian grape varietals. Her label, Lepiane, (“Lay-Pee-on-ay”), translates to “the plain” in Italian, Thomson said. Her winery honors her great grandfather, Luigi A. Lepiane, a native of Piane Crati in Calabria, Italy, who brought his family to California in search of a better life. He put down roots in California’s Central Valley town of Hollister, where he founded a grocery and, in 1935, a winery, L.A. Lepiane, Thomson notes on her website. During his years as a vintner, Luigi Lepiane produced as many as 1,000 cases of wine each year, Thomson said. After his death, Thomson’s relatives found blueprints for the construction of both grocery and winery, as well as letterhead for the winery, she said. After graduating from UCSB, Thomson worked at Sunstone Winery, and up in Napa at a tasting room. From 2004 to 2007, she attended UC Davis to pursue a master’s degree in viticulture. During her studies, Thomson interned for a top winery in Barolo, Italy, further deepening her love of all things Italian. In the ensuing years, back on the West Coast, Thomson married George, and in 2008 was hired as assistant winemaker at Palmina Wines in Lompoc, where she remained until 2011. Thomson and her husband are parents to Julia and Mick. Later in 2011, Thomson migrated to SAMsARA Wines for an assistant winemaking position, and honed her winemaking skills with owner/winemaker Chad Melville. Italians endeavor to marry food and wine and conversation. It’s obvious speaking with Thomson that the years she’s spent focused on Italian varietals have influenced her winemaking style. 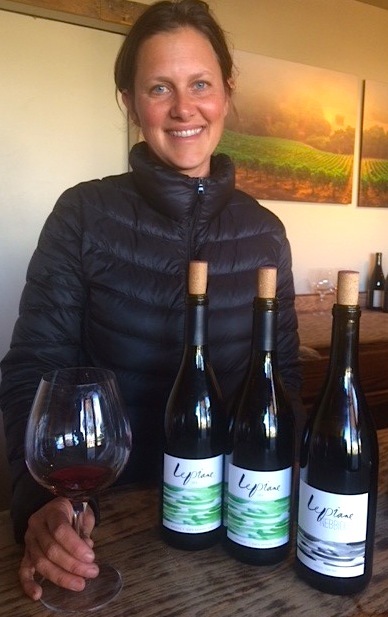 In 2013, using Barbera grapes purchased from Palmina owner Steve Clifton, Thomson launched Lepiane Wines. Today, she produces small amounts of the Italian grape varietals Barbera and Nebbiolo, as well as grenache. “Barbera is a great grape because of its acidity and versatility,” she noted. She would like to pursue bottling an Italian white wine — with either Fiano or Greco grapes — as well, Thomson said. “Santa Barbara County is great for growing these Italian varietals,” she added. Her Barbera grapes hail from Walker Vineyard, located on Alamo Pintado Road across from Honea Vineyard, Thomson said. The grenache she sources from Black Oak Vineyard, and Nebbiolo from Sisquoc Vineyard. Thomson’s 2013 Nebbiolo was bottled just last August; she plans to release it early this year. I found this wine to be an intriguing mix of rose and floral perfume notes, yet also very masculine on the palate. With total production of less than 300 cases annually, Thomson can easily be considered the smallest of the small labels in Santa Barbara County. She utilizes some whole cluster fermentation, neutral oak and only native yeasts in her production, she said. Her wine barrels share the Lompoc Ghetto winery facility of Jalama Cañon Ranch Vineyard, where Thomson is also the vineyard manager and winemaker. In addition, she oversees another vineyard in the Santa Ynez Valley, and winemaking for a client in Montecito. The moderator will be Antonio Gardella, a longtime Santa Barbara resident who has devoted much of his life to selling wine and educating the public about the joys of the vine. Following the hour-long Q&A session will be socializing and tastings from 10 local wineries, as well as food from six vendors. Guests will have the opportunity to mingle with participating winemakers. Clendenen: Robert Parker named Clendenen to his short list of “Best Wineries in the World” in 1989 and 1990, and in 1991, the latter was selected by Oz Clark as one of 50 creators of the world's “Modern Classic Wines." In the years since, multiple other awards have followed, and Clendenen continues to produce ABC, as well as several smaller labels, from the production facility he shares with Lindquist on Bien Nacido Vineyards in Santa Maria. Clendenen’s tasting room is in Santa Barbara. Brander: While he is well documented as producing the best sauvignon blanc in California, Brander puts as much effort into small lots of several red Bordeaux grape varietals, among them cabernet sauvignon and merlot. He recently celebrated the 40th harvest at his estate vineyard/winery/tasting room in the new Los Olivos District — Santa Barbara County’s newest American Viticultural Area — and yes, he was a driving force behind getting recognition for that appellation. Brown: This vintner was among the first to recognize Santa Barbara County’s potential as a powerhouse for pinot noir and chardonnay, especially in the cooler Santa Maria Valley and Sta. Rita Hills’ AVAs. That was in the mid- to late-1970s. Brown and Lindquist were also the first to plant and produce, respectively, the syrah grape, in this county (at Zaca Mesa). Brown’s tasting room is in Buellton. Lindquist: This winemaker has been producing award-winning Rhone grape varietal wines on the Central Coast since the early 1980s, among them grenache, viognier, roussanne, marsanne and, of course, syrah. Lindquist and Brown earned reputations for being the earliest winemakers to believe that syrah would become one of this county’s most widely planted varietals. A longtime Los Angeles Dodgers’ fan, Lindquist bottled a chardonnay and a syrah for the team and the public, releasing them to accolades and national press early this year. Tanner: Along with Clendenen, Brown and many others, Tanner believes that the Santa Maria Valley is one of the hottest cool-climate spots for pinot noir and chardonnay wines — those that make the world sit up and pay attention. Tanner’s first vintage was in 1981, as an enologist for Firestone. Later winemaking gigs included Zaca Mesa and the Hitching Post, and in 1989, she founded her own Lane Tanner Wines label. Tanner’s latest project is Lumen Wines, a label she co-owns with Will Henry, owner of Pico in Los Alamos with his wife, Kali Kopley. Longoria: “From the very beginning of my career,” Longoria says, “I felt that the Santa Barbara wine region had the potential to produce world-class wines, and it’s been very gratifying to see that belief realized over the more than 30 years I’ve been here. It’s also been very rewarding to have had the good fortune over the years to have some of my wines contribute to the acclaim of our wine region.” Longoria’s winery and tasting room are located in Lompoc. Details on Sunday: Event takes place from 1 to 5 p.m. in the Fleischmann Auditorium at the Mission Creek campus of the museum, located at 2559 Puesta del Sol in Santa Barbara. About the museum: Founded in 1916, the Santa Barbara Museum of Natural History reconnects more than 100,000 people each year to nature both indoors and out. The Museum has 10 indoor exhibit halls that focus on regional natural history, including astronomy, birds, insects, geology, mammals, marine life, paleontology, plant life and the Chumash Indians. The museum is also home to the only full-dome planetarium on the Central Coast, a research library, and the John & Peggy Maximus Art Gallery. The Museum’s outdoor exhibit experiences include a nature trail, the Chumash Sukinanik’oy Garden, The Museum Backyard & Nature Club House, the Butterfly Pavilion — and a real 74-foot Blue Whale skeleton, which is visible from the road and turns quite a few heads. The Museum’s outdoor nature experience at its Sea Center located on the historic Stearns Wharf. This facility provides the nearly 100,000 people who visit it annually a window to ocean life in the Santa Barbara Channel via interactive exhibits and close-up, hands-on encounters with sea creatures. One of the Central Coast’s most enduring wine events and a major fundraiser for several nonprofits in two counties will this year expand into Santa Barbara County when it opens Wednesday, Aug. 10. The Central Coast Wine Classic, now in its 31st year, comprises 18 events over the course of five days. Among those events are barrel tastings, live and silent auctions, symposiums, dinners, lunches and special tours and wine tastings. One of most popular events is the Thursday dinner at Hearst Castle in San Simeon. That event is $1,250 per person. The Wine Classic opens Aug. 10 with a barrel tasting of an array of California wineries from 5 to 6:30 p.m. at Greengate Ranch & Vineyard in the Edna Valley, and culminates with a sold-out VIP Champagne Louis Roederer & Black Caviar Brunch in Santa Barbara at Stella Mare’s. As of last week, at least seven of the 19 events had already sold out, including the final brunch, all of the Friday evening dinners and the Edna Valley tour, also on Friday, said a CCWC organizer. Archie McLaren is the founder of chairman of CCWC, and relocated almost two years ago to downtown Santa Barbara after residing in San Luis Obispo County for decades. His employees say he holds the history of the CCWC in his head. “I’m trying to be an extension of Archie’s brain” when it comes to organizing the multiday event, said Beverly Aho, one of McLaren’s employees since 2006 and a resident of Avila Beach. Aho and Bord both volunteered for CCWC (Bort for 20 years and Aho for 10) before McLaren hired them to assist him with event organization and production. While they’ve been colleagues for more than a decade and work closely via e-mail and phone, the two women have “never met” in person, Aho chuckled. Bort, her husband and a group of others teamed to found the annual Live Oak Festival that takes place in June at Live Oak Camp along the Santa Ynez River, she said. The Live Oak Festival continues to benefit KCBX to this day. Bort is a graphic designer who just completed her 31st version of the annual catalog that showcases the live auction items available during the event. The lots are “a mix of lifestyle items and wine and are very unique,” Bort told me. The Wine Classic caters to guests “from all over the world” who help fund Central Coast nonprofits with their auction purchases, Aho said. She and McLaren personally speak to every potential guest interested in event attendance, she said, adding that organizers strive to offer “personalized assistance” to help guests decide which event is best suited to their tastes. To reach Aho for tickets or additional information, call her at (805) 235-8130, or inquire via e-mail at sylphie333@yahoo.com. While in its early days the CCWC was a fundraiser solely for KCBX-Central Coast Public Radio, more recently it has boosted the coffers of multiple nonprofit organizations in both counties. Since 2004 when the Central Coast Wine Classic Foundation was created, CCWC has raised a whopping $2.5 million for 125 organizations that focus on studio arts, performing arts and healing arts, according to a news release. Among the beneficiaries for 2016 are the Hearst Preservation and the Friends of Hearst Castle Foundation, the Léni Fé Bland Performing Arts Fund and the Boys & Girls Club of Northern San Luis Obispo. Among the highlights of the 2014 live auction lots: 60 bottles of fine French red Burgundy that sold for $35,000; a 2014 harvest dinner for 24 people that was presented by Au Bon Climat and the Buellton Hitching Post restaurant, $24,000; a wine and culinary tour of French wine country for two people, $20,000; a dinner with McLaren and baseball legend Tim McCarver and a dozen bottles of rare wine, all the 1984 vintage, for $20,000; and a gourmet food & wine cruise for two from Singapore to Hong Kong for $15,000, according to publicist Maureen McFadden, handling media for McLaren for the fist time this year. Bacon. Love it … or not. Actually, I am not acquainted with anyone who doesn’t eat good bacon like the end of the world is near. I even have a friend who married a vegetarian and eliminated all meat from her diet. But here and there, she still indulges in bacon, because it’s the one thing she cannot live without. To be clear, I don’t consume much bacon at home, but it’s a staple when I dine out. And so I dined well at the VIP (“Very Important Pig”) dinner last Friday that kicked off the Bacon & Barrels celebration, held this year for the first time in San Luis Obispo County. That evening took place at Biddle Ranch Vineyard, located on the road of the same name, just off Highway 227/Edna Valley Road. Ryan Deovlet (of Deovlet Wines, and also of Refugio Ranch Wines) has been the winemaker at Biddle Ranch since the 2014 vintage. Chef Maegen Loring crafted the meal. She’s the owner of Maegen Loring Catering and a longtime favorite on the Central Coast for her knack pairing area wines with fresh, local fare. The Biddle Ranch winery’s tasting room is surrounded by ample outdoor space that Bacon & Barrels’ staff put to good use that evening. The walled-in side yard, deck and courtyard protected us from the afternoon breezes as we commenced with appetizers and wines. First up was the Biddle Ranch 2015 Rosé, a delicate but flavorful blend of 60 percent sangiovese and 40 percent syrah. Soon making the rounds were paper cones full of popcorn dusted with chicharrones dust, a finger-licking delight when paired with the rosé. Next in line came my favorite for the evening: Candied bacon “cracker” with whipped feta cheese, grapefruit and herbs. By this time, some of us had estate chardonnay in our glasses, which also married with this delightful bite of rich herbs plus savory bacon. Pure deliciousness. The first course, steamed clams with butterbeans, pancetta, orange aioli and oregano showcased the freshest clams soaked with essence of orange and bacon sauce. The accompanying wine was the Biddle Ranch 2014 pinot grigio. Then came second: Flatbread topped with chevre, prosciutto-wrapped beets and pickled greens, and paired with pinot noir. … which meant I had zero room left for dessert: Bourbon-bacon pecan pie with orange caramel. I appreciated Loring’s effort to keep the dinner “family style,” which for me translates to smaller servings all around. When meals are plated, one often ends up with too much food, which means we often overeat, and/or food gets wasted. Kudos all around to Loring and Holly Holliday, owner of Create Promotions, organizer of Bacon & Barrels. Bacon & Barrels celebrates four years of bacon-inspired food and barrel-aged libations with its San Luis Obispo County debut this weekend, July 15 to 17. Holly Holliday, founding queen of Bacon & Barrels and owner of San Luis Obispo’s Create Promotions, parent organizer of this event and BubblyFest, relocated the popular event north from its early locations at Saarloos & Sons’ field in Los Olivos in 2013 and 2014, and last year, at Buttonwood Farm Winery & Vineyard outside of Solvang. In 2014, just one year after launching Bacon & Barrels in Los Olivos, Holliday added a sister event every May since, in San Diego. While general admission tickets remain available for this Saturday’s event at Madonna Inn Meadows, the coveted VIP (all-weekend access) tickets just sold out. In the case of Bacon & Barrels, VIP stands for “Very Important Pig,” and guests who partake in that status take it Very Seriously. VIP attendees will enjoy all three sections of Bacon & Barrels: Friday evening’s kick-off dinner at Biddle Ranch Vineyard House; early admission (noon) to Saturday afternoon’s festival at Madonna Inn Meadows with exclusive access to the lounge; and finally, the Buffet & Bloody’s Sunday Brunch at Sidecar, 1127 Broad St., also in San Luis Obispo. The tickets that are still available (get yours today, as they will not last) include early-admission (noon to 5 p.m.) for the festival Saturday ($80); general admission (1 to 5 p.m.) ($60); and both categories of the designated non-drinker tickets ($30), for early and regular entry to the Saturday event. All Saturday tickets include parking, a glass, live music, live chef and mixology demonstrations, and all food samples — while supplies last. You won’t leave hungry. Those who pay to sample the libations get all of the above — plus everything alcoholic. About those live demonstrations: Chefs from the hottest restaurants will prepare and proffer small plates starring the most creative forms of (what else) — bacon and pork belly. To pair with the nibbles will be drinks from brewers, winemakers and mixologists, who will offer bacon-inspired and bacon-based libations. You really cannot go wrong here, folks. The Spazmatics will provide live music Saturday. Holliday notes that Bacon & Barrels is proud to support the Create Community Foundation, which provides grants and assistance to organization that serve at-risk youth. In addition, the festival makes it an annual goat to divert 95 percent of its trash from landfills via cutlery, napkins and cups that are biodegradable and compostible. Winemaker Michael Larner and his family will open their private Ballard Canyon Road estate vineyard from 1 to 3 p.m. Sunday, April 24, for the 2016 return of Larner Fête. Providing the food will be Autostrada Wood Fired Pizza and Amaranto Catering, and musical entertainment will be by the Ruben Lee Dalton Band. The 2016 Larner Fete will feature seven wineries that source Larner Vineyard grapes. Pouring their wines will be Sonja Magdevski of Casa Dumetz Wines; Scott Sampler of the Central Coast Group Project; Craig Jaffurs of Jaffurs Wine Cellars; Mikael Sigouin of Kaena Wine; Michael Larner of Larner Vineyard & Winery; McPrice “Mac” Myers of McPrice Myers Wines; and Larry Schaffer of tercero wines. All proceeds from the event will benefit the Viticulture & Enology Program at Allan Hancock College in Santa Maria. Since it was planted in 1999, the Larner Vineyard has provided grapes to winemakers across the Central Coast and beyond. Most of the wineries that purchased fruit as early as 2001, when the vines were first mature, remain clients of Larner Vineyard today. More than two dozen winemakers produce wines sourced from the syrah, grenache, mourvedre and viognier grapes grown on the 34-acre estate vineyard. Larner Fête attendees will be shuttled to the vineyard property from pick-up locations in Solvang and Buellton. Location details will be e-mailed to guests with confirmation of ticket purchase. Restaurants in the Lompoc Valley will showcase their food and drinks during the inaugural Winter Restaurant Week, Sunday, Feb. 21, through Saturday, Feb. 27. The Lompoc Valley Chamber of Commerce & Visitors Bureau (LVCC&VB), the Sta. Rita Hills Winegrowers Alliance (SRHWA) and Shop Lompoc, Shop Small (SLSS) teamed to sponsor the seven-day celebration of culinary creativity in junction with the city’s restaurant and winery owners. For $20.16, plus tax and tip, Winter Restaurant Week will allow dining patrons an opportunity to choose from a prix-fixe meal, a two-for-one dining option or a special event. Some eateries may also offer wine or beer pairings for an additional charge. Some will offer lunch and dinner, but others only one or the other. We want people to come out to eat and enjoy themselves at a historically slow time for the restaurant industry,” said Ken Ostini, president/CEO of the LVCC&VB. “Lompoc has some really unique restaurants with a wide variety of cuisines. We would love for out of town folks to come try us out and taste what Lompoc has to offer. “There will also be opportunities to win a $25 gift certificate, as each participating restaurant will be awarding one at the end of the week to a lucky diner,” Ostini said. I e-mailed questions to two of the three participating winemakers: Larry Schaffer, owner/winemaker of Tercero Wines, and Eric Mohseni, director of winemaking and vineyard operations at Zaca Mesa Winery & Vineyards. Bob Tillman, owner/winemaker with his wife, Lynn, of Alta Colina Wine, will be the third participating winemaker during the seminar. Mourvèdre, also known as mataró or monastrell, is grown widely around the world. Among its favored growing regions are the Rhône and Provence regions of France; in Spain; in Australia’s New South Wales and South Australia, and, closer to home, in Washington and across California. In Santa Barbara County, the highest concentration of mourvèdre plantings can be found in the greater Santa Ynez Valley, specifically in the Ballard Canyon and Happy Canyon sub-AVAs, where temperatures top 90 degrees during the late summer and into fall. That’s ideal weather for mourvèdre, which needs warmth and lots of hang time for optimal maturation. Those attending Saturday’s “Digging Deep into Mourvèdre” seminar can look forward to an array of our region’s mourvèdre wines, according the organizers of the Garagiste Festival. Schaffer: “I get mourvèdre now from a plethora of different vineyards, depending upon what is available each specific vintage. The “constants” for me for my red wine are Camp 4 and Larner (since 2010), and Vogelzang Vineyard for my Mourvèdre rosé (since 2013). Question: Give me a bit of background about the grape … Where does it thrive, and in what countries is it most heavily planted? Schaffer: “Mourvèdre is native to Spain, where it is known as Monastrell and is second only to Grenache (or Garnacha) in terms of importance for red varieties. It hails from the Spanish town of Murviedro, near Valencia, and was most likely brought into France to the Provence region during the Middle Ages. “It was a dominant variety in this region until Phylloxera hit the region and others in France in the late 1800s. “It turns out that the variety proved much more difficult to graft to post-phylloxera rootstocks than other Rhone varieties, and therefore it was not as heavily planted in CdP, for instance, compared with Grenache. It’s also why the variety did and continues to do well in sandy soils, like Bandol (and Larner and Vogelzang). “When mourvèdre was brought into this country, cuttings came from the area around Barcelona, where the grape was known as Mataro. In fact, to this day, on the California Grape Crush report, the variety is still called Mataro here in California. Question: Tell me your thoughts on working with the mourvèdre grape. Schaffer: “Mourvèdre is both similar and dissimilar to other Rhone varieties that I work with. Like Grenache, it is very late ripening, making it a “pins and needles” variety in some vintages. “But unlike any other red variety that I work with, the berries are not very turgid at all, and once cold soak begins, the skins begin to give way, making the cap more “mushy” than other varieties. Sounds strange, but it's true. Because of this, the skins tend to stick to each other, and scents of volatile acidity at the beginning of fermentation, whether or not the grapes are innoculated, seem commonplace, but blow off once fermentation kicks in big time. Mohseni: “It can be a little of an enigma … It is a late ripener, but in some vintages it is the first to come out of dormancy and push. It has a nice growing season, but about a month before harvesting it can desiccate and have excessive "dimpling.” Not sure why … we watch closely and water accordingly, but regardless of water, it will still desiccate. Since the grape has very thick skins, mourvèdre can weather the storms, so I don't worry about it in tough wet vintages (not like we have had many of those). Usually as grapes ripen, the “meat” softens up. Question: Grenache used to be a blending wine, and now look at it! Does the future hold the same for Mourvèdre? If not, why? Schaffer: “Though it is “rare” to find mourvèdre bottled on its own in this country, it is common to see it done so in Spain. Here in the United States, one of the reasons it has not historically been bottled on its own is because it is challenging to “fully ripen,” and therefore ends up showing its meaty, earthy, funky qualities, ones that do not lend themselves to mass appeal. “The challenge, therefore, is to find sites where it will ripen to the extent I am looking for and still retain the properties the variety is known for. Mohseni: “I love blending with mourvèdre! It always helps the ZGris (from Zaca Mesa) and I love our ZCuvee when it is mourvèdre based. I lean to more savory and rustic notes, and mourvèdre is a perfect vehicle for that. It is not as bold and rustic as (mourvèdres from) Bandol.. California mourvèdre has more fruit. Question: What are some of your favorite mourvèdres? Schaffer: “That’s a good question. I like what Hardy Wallace is doing with his Dirty and Rowdy label, but his is a very different take on the variety — much lighter hand during fermentation, not a lot of extraction, more “delicate,” if that makes sense. “I really enjoy the mourvèdres that Zaca puts out year in and year out; I've been a fan of Cris Cherry at Villa Creek, especially his last few vintages. I used to enjoy the Cline Old Vine mourvèdres, but have not had one in awhile. And Ken Volk certainly has made some great ones for a long long time. Oh, and a nod to Bandol in general. Winemakers Anna Clifford and Brittany Zotovich always have something new up their collective sleeves. The two, the minds behind Dreamcote Wine Co., this year produced small batches of hard apple cider, which will be formally released this Sunday, Oct. 4, at the Dreamcote Fall Wine Release party, along with a new grenache, sausages and small-batch mustards and yes, guests wearing lederhosen. In North America, “cider” is unfiltered apple juice. Beverages such as Dreamcote’s are known as hard cider, as they are fermented. While alcohol levels vary, they're usually below 10 percent. Dreamcote's is at 7 percent. I caught up with the ever-affable Zotovich earlier this week in Buellton at Terravant Wine Company, where she is senior director of sales/winery services. For several months, Dreamcote's 100-percent apple cider has been available by the bottle, but only recently have Clifford and Zotovich also made it obtainable via 2-liter growlers, poured straight from the keg. The Dreamcote cider can be found at Scratch Kitchen in Lompoc and Industrial Eats in Buellton, as well as at a couple of Los Angeles accounts, where sales “are cranking,” Zotovich said. She and Clifford are enthusiastic about experimenting with “cider trials” when they produce another batch in the next few months, and, Zotovich added ,“we hope to evolve into a line of seasonal and fruit ciders,” such as one made with apricots. She discovered new inspiration by attending the Cider Summit in Portland last June. The Northwest Cider Association sponsors the two-day event in the food/wine/craft beer/spirits-savvy city. Zotovich returned home full of ideas and with a bright tank (vessel for secondary fermentation of beer or cider) in the back of her truck. While Portland is a metropolis, it showcases an entrepreneurial spirit reminiscent of a smaller town, and encourages hand-crafted goods of all types. The earnest and enterprising Zotovich took note. Dreamcote's Fall Wine Release Party will take place from 11 a.m. to 4 p.m. in Los Olivos, 2933 San Marcos Ave. (down the street from the corner of San Marcos and Alamo Pintado avenues).